Vortices pop-up in the weather, sink drains, and even astrophysics; they are also a feature of quantum superfluids, such as an ultracold atomic gas. Quantum physics dictates that the circulation in these systems obeys certain quantization criteria. When a superfluid is disturbed vortices will form in order to satisfy this circulation constraint. Vortices look like mini-tornados, having an essentially empty core or “eye” with the surrounding atoms circulating. Recently JQI researchers used computer simulations to predict the behavior of magnetic atoms in a dipolar Bose Einstein condensate. 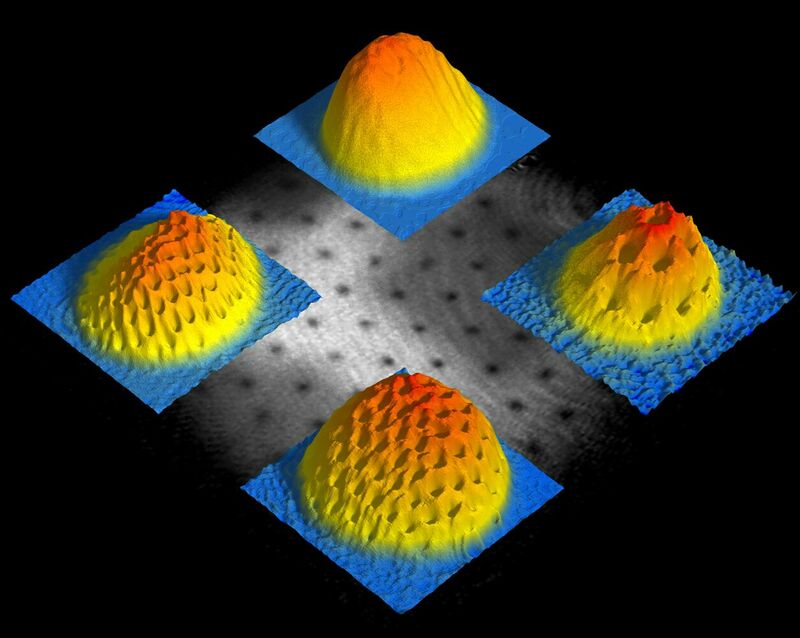 When the atoms were subjected to additional laser beams the magnetic interactions among the atoms caused them to sort into striking spin texture patterns, including a “coreless vortex,” a condition in which one component of the atoms circulated around another component of atoms at rest in the middle (See image in above gallery).